Having hiked, camped, rafted, rode horseback, and tangoed across Chile and Argentina just a little over a month ago, it is now time to share some of my characteristic good times and good stories. Although Chile’s national language is Spanish, I chose an expression, “Tudo Azul,” which comes from Portuguese. It literally translates to everything’s blue, but is more commonly understood as everything’s rosy. Thus,“Tudo Azul,” ties together the positive experience I had traveling through Patagonia as well as the strong hues of BLUE witnessed around every corner. Not surprisingly, the connection to the title and the color blue has double reasoning as well. First and foremost, it is important to highlight that Torres del Paine means Blue Towers; torres is towers in Spanish and paine comes from a native language meaning blue. Secondly, as you can see in my images, the towers are not blue themselves, but they do reach to a majestic blue sky (pictured right). Additionally, vibrant blues are displayed throughout the park with hues of turquoise, aquamarine, baby, and others as seen at Lake Pehoe (beginning the post), Grey’s Glacier (pictured below), and more. As seen from the lookout, the “Blue Towers” stretch through the clouds to the blue cielo with a mountain fed, turquoise lake gracing its feet. Although the lake’s water appears like the Caribbean, I can verify it not nearly as warm (brrrr). The timing of my trip during summer was perfectly planned (ok rather last minute), but the waters were not up to my South Florida resident likes by a long shot. Coincidentally, it is a good thing that I happened to time my travels in summer as the Patagonian climate can TEST one’s perseverance. Even in the summer months, it is common to can have sleet, rain, wind, sun, and more all within hours or minutes of each other; thus, costume changes from gloves to poncho and rain gear to shorts are rather frequent. In fact, I think I successfully did more costume changes than Brittany Spears or Madonna do in a concert. 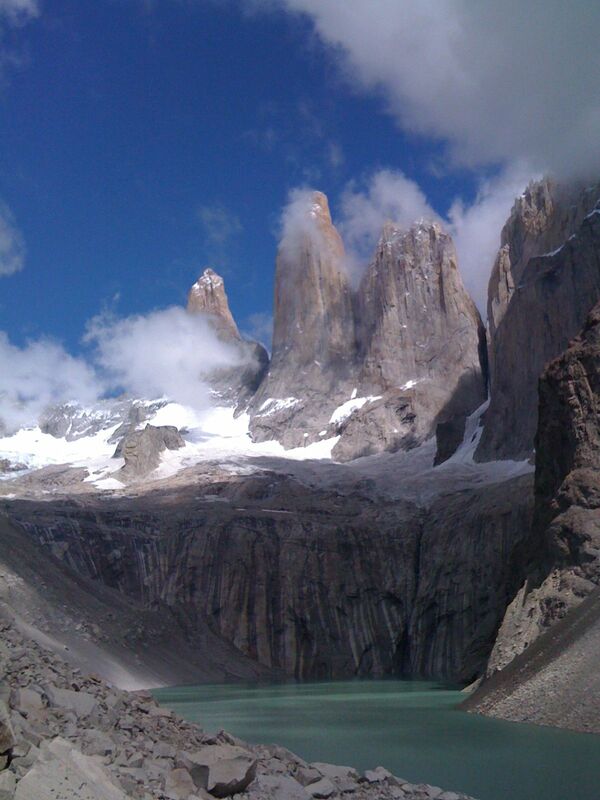 I, however, did them all in one Patagonian hike. 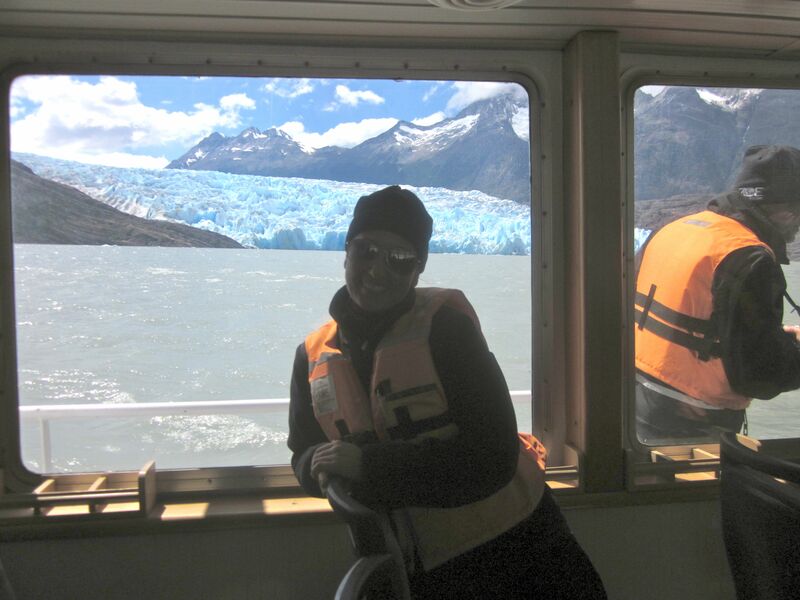 To the left, is a picture of my first glacier experience. This lookout was a four hour hike from the overnight camp at Lake Pehoe (pictured at top of post) all while passing waterfalls, calafate plants, guanacos, and more. 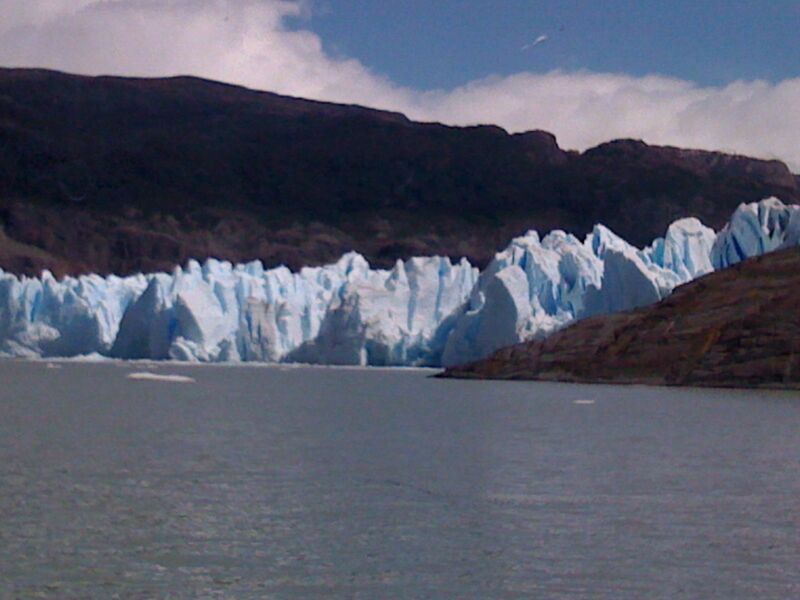 Upon reaching the lake’s side, I boarded a boat to get as close to the glacier as possible. For the first time, I was aboard a ship with small icebergs floating around the vessel, which I did not know would eventually become part of the cocktail service with a Chilean favorite, Pisco Sour. I have shared with many that I never thought that I would experience such beauty with a glacier, but the almost snow cone blues were bursting from the crevices to make for a wonderful background while relaxing aboard the boat with my feet up, rather tired after two days of hiking and more to go. Keep posted for more about the 2nd and 3rd legs of my South American Walkabout through Mendoza & Buenos Aires, Argentina. How was your experience with your first glacier and did you enjoy the four hike? Chile seems so nice I was planning on visiting Argentina this year.